It took me about half a day to loose my sun glasses in the thicket of brambles, brush, trees, and other random spiky things we encountered on our first day of looking for cave leads at ~2,500 meters elevation in the state of Puebla, Mexico. The first half day of sunshine, that is, after about three of pretty much non-stop heavy rain -- after all, we were in some sort of cloud forest. 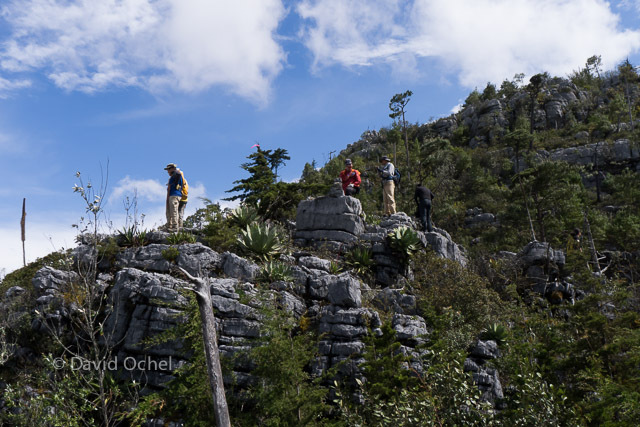 Mexican (and Australian ;)) friends invited me to participate in their annual expedition up in the Sierra Negra mountain range, and I excitedly agreed to come out for the full month of the expedition. 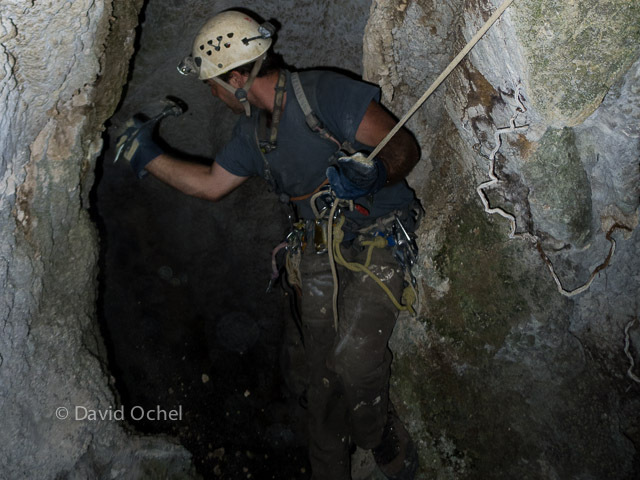 This expedition features some great Mexican cavers (as well as a few from other places in the world); had previously produced caves over a kilometer deep; and I was keen on spending some time in an environment that would actually force me to improve my pretty much non-existing Spanish. Gathering back together after a day of swarming out high on Tzontzecuiculi to look for caves. A typical exposure of weathered limestone; the brush down in the forest can be much worse to travel in. Potential cave leads closer to base camp, and to the little town Ocotempa at the base of the mountain, had been "exhausted" in previous years. (To the level of thoroughness one would expect if there are potential exciting leads elsewhere on the mountain that nobody has ever looked at.) And so we cruised (and oftentimes stumbled) over the very weathered and much-exposed epikarst; thrashed (and often cleared our way with machetes) through the undergrowth of the (mostly) pine forest, and in and out of sinkholes; in areas between one and three hours away from base camp. A propos base camp. 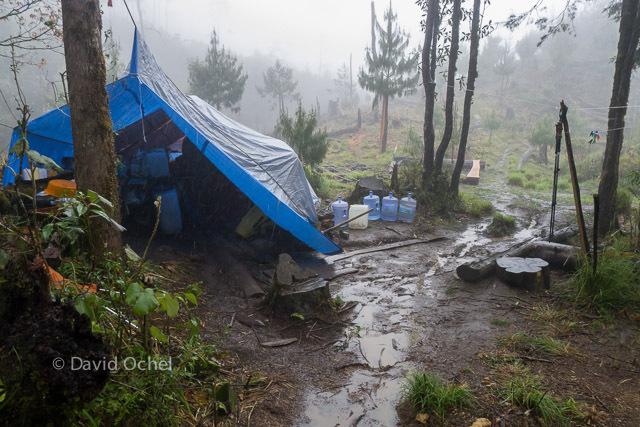 Located a couple hundred meters above and few kilometers from the next town, at the location of an old logging site, exists a spot on the mountain that has sufficient flat grounds for a large communal tent structure as well as individuals' personal tents. Scrap wood from the locals' logging operations conveniently helped with the creation of some basic structures, such as a large table and a kitchen area that already existed from previous expeditions. Finding wood for campfires, which were also used to get rid of most of our trash in accordance with local custom, wasn't a problem either. In camp on a rainy day. The water jugs are already full from collecting rain water off of tarps. TTW28 was found this year on the west side of the mountain, at almost 2,700 meters elevation, after a good day or so was spent early on to establish and cut a trail to that side of the mountain for easier travel to that prospecting area. After a hundred-and-something meters of depth the cave required a bit of chiseling to enlarge a constriction, but then continued well. 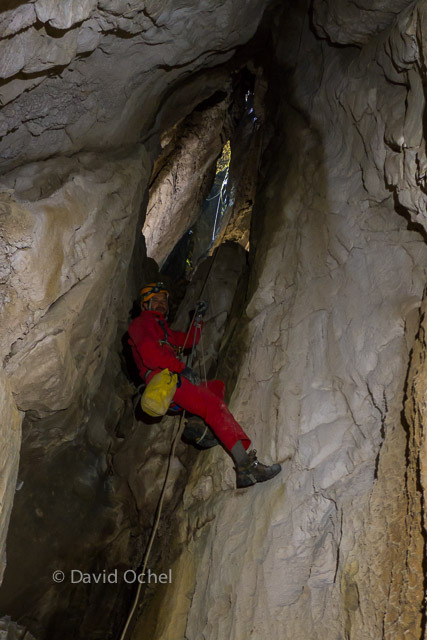 Since we had only one set of bivvy equipment, which was in use at Doncella, this eventually involved long day trips from base camp as the depth of the cave continued to grow. This cave was left going at the end of the expedition as well, with an exciting pit half-way rigged. In the entrance of TT103. Cleaning eroded limestone off the wall in order to place a bolt anchor for the rope. And not least, this may well have been one of the most socially developed (in a positive sense) expeditions I have been on. A number of friends who mostly know each other fairly well (and yet were extremely welcoming to me as a new group member and not-much-Spanish speaker); sharing of not just food, but all sorts of gear, including each other's vertical kits and caving suits (who wants to drag their many kilograms of personal gear to another part of the mountain every day? ;-)); and temporary contribution of individual rigging gear for group use by each individual instead of commercial sponsorships or huge expedition fees. (In addition to a number of things that have been amassed over the years in a group stash, everybody brings some rope, rigging gear, ...) Etc. Exiting a cave from where it bottomed out. You can see the daylight and vegetation in the entrance.